Cushioned inner soles for comfort. Front is black canvas leather lined, the heel is blue leather. The sides are silver. I took a close-up pic (see photo). 1 3/4" NATURAL COLOR STACKED KITTEN HEEL. POINTY TOE. LEATHER UPPER. MAN-MADE SOLE. 2016 SEASON. NOTE: Minor scuff on LEFT/Front toe area (see pic). 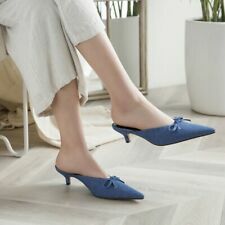 Vionic Josie Pointed Blue Kitten Comfort Heels. See picture #3 for bending in the toe cap, no noticeable when worn. Beautiful J Crew Blue Heels 5 1/2. Condition is pre owned. Excellent condition, worn twice. Bought at jcrews semi annual sample sale I recently stopped working and no longer need so many heels, so going thru my collection and selling. See my other listings. They are navy with a kitten heel. Size: EU 38/ US 7 1/2-8. 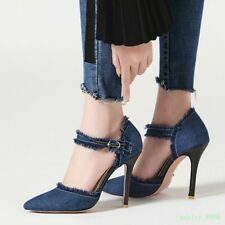 Soft Style Kitten Heel Navy Pumps 11. Shipped with USPS Priority Mail. Fidji E200. Heel is about 1.25" tall. Super unique shoes that feature a blue background with multi-colored stripes and a large bow, made of the same material, at the toe area. These feature a short, kitten heel. They are in excellent, brand new condition. Betsey Johnson blue Green Pumps Womens Size 5.5 Fabric High heel Shoes Sample. Condition is Pre-owned. Shipped with USPS Priority Mail. Labeled by manufacturer as a size 6 1/2 in ladies'. Heel is 2 3/8" high in back. How's that for a good deal?!?. NEED MORE PICTURES?. I really try not to list things that I know are not at 100%. Chances are, if you're looking for an item, you're probably more of an expert on it than I am! Mina Ladies 5.5m shoes.Worn twice.original price $80. Features upper blue multi-color canvas with pointed toe, lightly padded insoles for comfort, durable rubber outsoles. kitten heel of 2.5" high. Excellent condition. Talbots Pre-Owned Leather Navy Blue Peep Toe Strap. Ankle Strap Sandals with Zipper Closure at Heel l.
Loeffler Randall Juno kitten heels. Womens size 6B. Grips have been put on the bottoms but can be removed. There are a few small marks but otherwise in good condition. Please see all photos. If you have any questions please contact. Thanks! Beautiful! Light blue nubuck, low heeled pump. Worn once! Like new . Perfectly clean except the sole from wearing outside. Paid $120.00. Summer weddings, summer dresses, Easter, summer work wardrobe, perfect. Talbots Womens Shoes 11M. Condition is Pre-owned. Shipped with USPS Priority Mail. CUTE LOW HEEL SLIP ON, TEXTURED REPTILE PRINT,CUSHIONED FOOT BED. COLOR: BLUE. MAN MADE MATERIAL. New ListingWomens Nine West Size 7 Turquoise Slip On Heels-PERFECT! Womens Nine West Size 7 Turquoise Slip On Heels-PERFECT!. Shipped with USPS Priority Mail. Good used condition no tears or holes. Pet free and smoke free home. White scuff on left foot Insoles are coming up slightly Fabric is cracking on the inside See pictures for more details. Uppers are leather, bottoms are manmade materials and rubber. Leather has been cleaned and conditioned, still very flexible with no cracks. Features a Logo faux buckle on the side of the toe. STUART WEITZMAN. Kitten Heel. Suede Leather Upper. Heel High: 1 3/4". Leather Sole. Leather Lining. Pre-owned in very good condition with normal signs of wear(see pictures). Insole Length: 10 1/4". LILLY PULITZER Womens Blue Slides Shoes Kitten Heel Size 7 B. Condition is Pre-owned. Shipped with USPS Priority Mail. Had second thoughts about re-homing these gorgeous shoes--beautiful shade of blue/gray. Appropriate for work or an evening out. Leather upper-balance manmade. Insole has cushioned pad at instep of sole. Manmade anti slip sole. Never worn and perfect. Zara Suede Electric Blue Kitten Heels 5. Heels and toes of both shoes show no wear and are very clean. Sides of both shoes show no wear and are very clean. Shoes are in pre-owned condition and show signs of light wear. Length (heel to toe)-9". Womens Nine West Size 7 Turquoise Slip On Heels-PERFECT!